Make It Rain: Love of Money Android game update with fixed some investments making financial rate go down and fixed bug with cash blast amount. This game is available on iOS and Android which getting higher and higher on the top free games list this week. It's very addicting and well made just like Cookie Clicker. Obviously very similar to Cookie Clicker, but with money and investing instead. It’s a fiendishly clever game, that’s too simple and too easy and too hard and too fun. 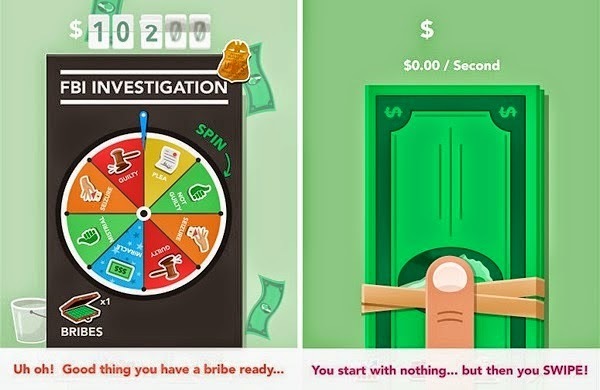 Make It Rain: Love of Money is a simple wealth building simulation game that touches upon basic principles of money management and investing. Don't change anything but add ranks. So when you have rained a certain amount of money you will get a rank like Maker Rainer or Storm Bringer. Extremely satisfying and simple, just start swiping and watch the money pile up. Hundreds, then thousands, then millions, then billions, then kili-billies, mega-billies, and beyond. But to get that much you’ll have to make some wise investments! Let's play and see how fast can you make it rain? good luck! - Can you beat the game? Get a crown each time you beat the game to show your riches! - Global currencies! Your bills will now appear in your country’s currency for 10 popular global currencies.